Give a gift this Christmas that will not only please your families and friends but which will also contribute in a very specific way to uplift the lives of financially needy young women in CALABARZON. Every year, Anihan gives out full-tuition scholarships to 120 young women who lack the means to study after high school. 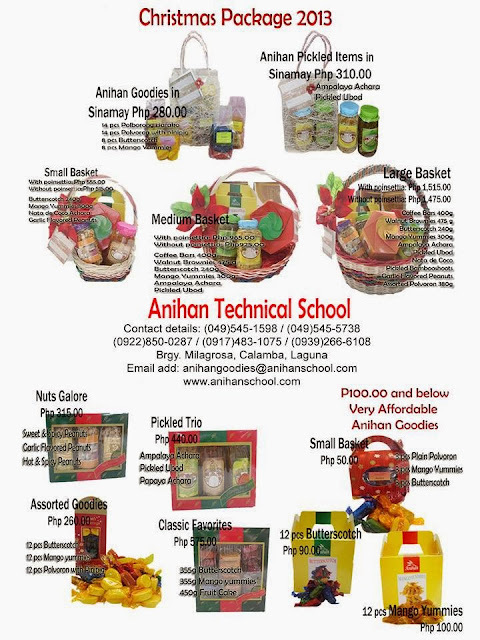 To sustain this project, Anihan relies on its own Livelihood Center where its graduates and students help out to produce the delectable Anihan Goodies. By choosing Anihan Goodies as your personal or corporate gifts this Christmas, you will be making a positive impact in the lives of at least 120 Filipinos. Our graduates' achievements can tell you how much their Anihan scholarship has helped them improve not only their lives but their families' as well. Click here to read about some of the Anihan graduates. Below are Anihan's Christmas packages for 2013. Click on the image for a larger view. Remember, when you include even just one box of Anihan’s butterscotch bars or mango yummies for each of your personal and corporate giveaways, you are already contributing to the education and training of at least one Anihan scholar. Wouldn't that be a beautiful Christmas gift? We wish all of you a meaningful Christmas!